Zhan Wang (Chinese, b. 1962), Artificial Rock No. 43 (detail), 2008. Stainless steel. Private collection. Photo by the author. What do you think of when I say rocks? Probably not much of consequence. Rocks scattered on the ground, surrounded by grass and dirt. Perhaps lining a path somewhere. Maybe caught in your shoe. Rocks are not a huge part of daily American culture (unless, perhaps, you are a gardener). But in China (you knew that was coming, right? ), rocks played an important cultural role in the life of an intellectual. For that reason, rockeries (or, rock gardens) are a theme threading through many of the Summer of CHINA exhibitions here at the Museum. Let’s bring those threads together in this primer on an essential component of Chinese art and culture: scholar’s rocks! We’ll start with the scholar’s rock below, from the 18th-century Qianlong Emperor’s retirement garden in the Ningshougong palace, the focus of our feature exhibition The Emperor’s Private Paradise: Treasures from the Forbidden City. This scholar’s rock is on full, glorious view as you enter the Museum exhibition, which is meant to simulate the experience of entering the garden itself. This garden was a place for the emperor to reflect and cultivate his spirituality. Together with artists, he planned every single structure, pathway, artwork, and, of course, rock in his garden to create an ideal atmosphere for for meditation and study. Lingbi stone. From second courtyard, in front of Suichutang. Limestone. 25 ½ x 44 1/8 x 15 ¾ inches (64 x 112 x 64 cm). (c) Palace Museum. Scholar’s rocks like this one were used by Chinese intellectuals to meditate. (For those of you who are familiar with Western art history, it’s sort of like a Medieval or Renaissance altarpiece, but a scholar’s rock is not necessarily religious.) Intellectuals generally lived in cities, but deeply appreciated the rawness and power of nature, particularly of water and mountains. Scholar’s rocks of any size, from paperweight-like desk decor to towering, 13-foot-tall objects, were placed in urban retreats and were meant to simulate mountains and stimulate the mind. This one from the exhibition is only two feet tall, but its scale is irrelevant to its meaning: you enter this little mountain with your mind, allowing your eyes to traverse the nooks and crannies of an object not influenced by man. You imagine that you are but a small being within this huge structure–as you are in reality, one small being engulfed by all of nature. One of my favorite tidbits of information about scholar’s rocks is that you want them to have imperfections. There are many different desirable characteristics of scholar’s rocks–holes, wrinkles, sharp edges, intricacies, and even what the Chinese called zhuo, a word that means awkward or ugly. It sounds cheesy, but these rocks, (usually) untouched by man, are pure nature–and thus beautiful in their imperfections. Wang Jiqian (CC Wang) (Suzhou, China, 1907–2003). Shanshui, 1990. Ink on paper. Chu-tsing Li and Family Collection. Photographed by Ken Howie. In the Museum’s Koss Gallery, Emerald Mountains: Modern Chinese Ink Paintings from the Chu-tsing Li Collection showcases the longstanding tradition of ink painting, a major theme of which is shanshui, which means “mountain and water.” You see where I’m heading, right? Although certainly not explicitly paintings of scholar’s rocks, works like the one at left also underline that essential idea of finding a place to reflect in the vastness of nature. Just as intellectual scholars found beauty and reflection within the surface of rocks, so too did the intellectual painters of mountains and water. These ink paintings are not faithful representations of a landscape, but instead are meant to show the painter’s own feelings about nature and their journey of meditation. Painting a landscape had a similar spiritual action as taking the time to identify a scholar’s rock, place it in your garden, and mentally engage with it for contemplation and reflection. 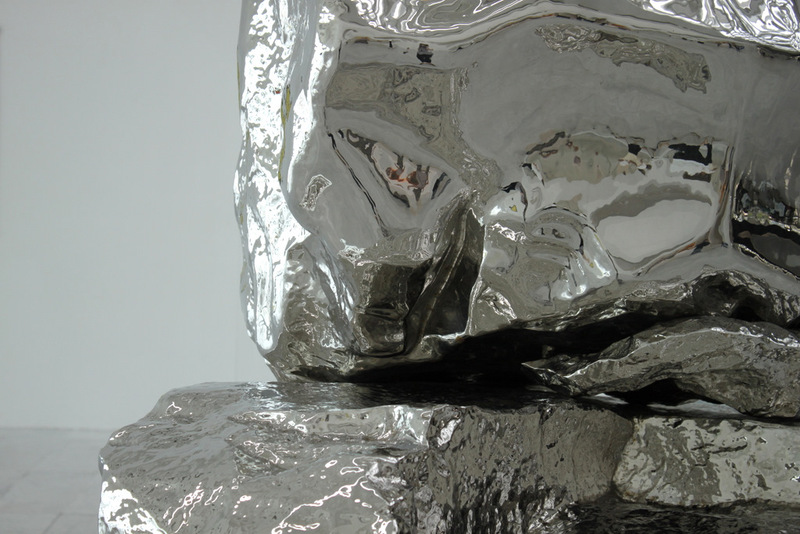 Zhan Wang, Artificial Rock No. 43 (detail), 2008. Stainless steel. Private collection. Photo by the author. 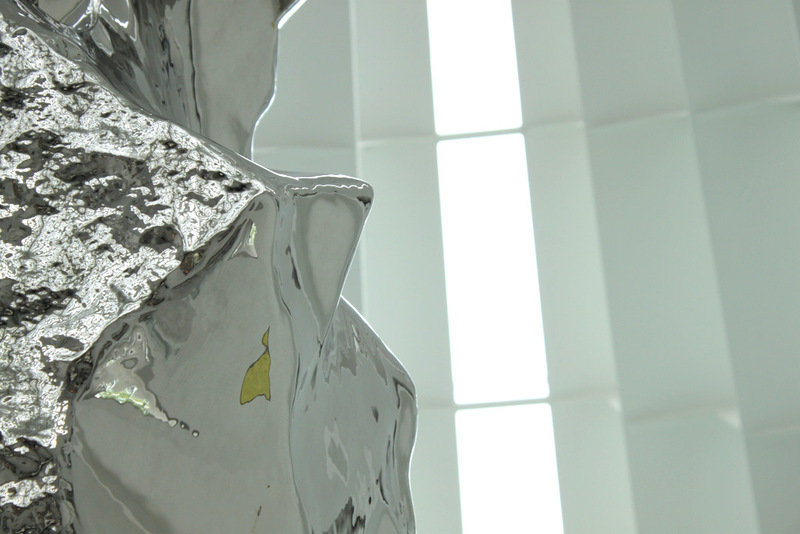 Elsewhere in the Museum, a 13-foot tall stainless steel sculpture reaches towards the sky. 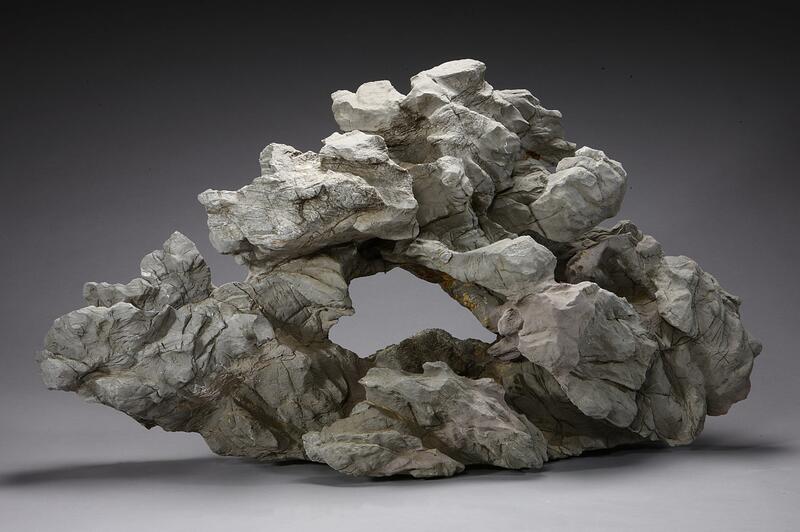 This 2008 work by sculptor Zhan Wang, found in Windhover Hall, is, of course, an interpretation of a scholar’s rock. 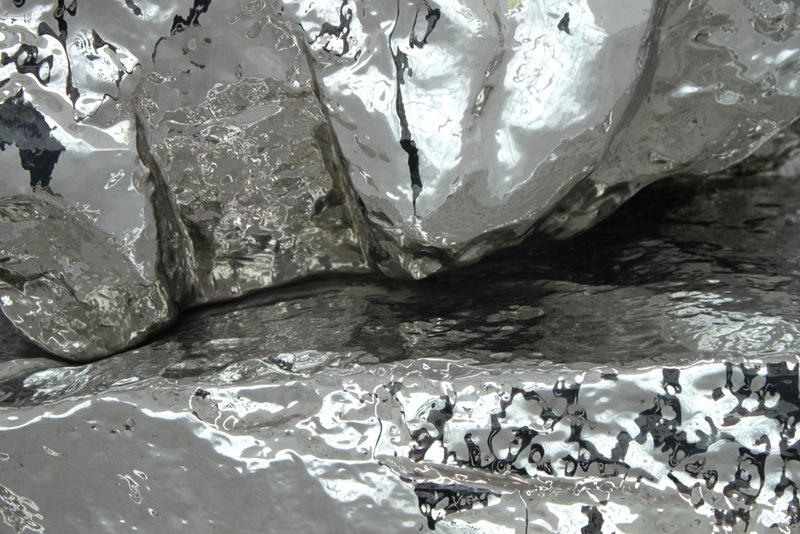 Wang literally molds steel (banging, bending, heating) onto the surface of an actual scholar’s rock, peels it away, and reconstructs it to create a life-size, glossy sculpture. But it is less the craft and more this work’s meaning that makes Wang’s interpretation so powerful. You’re probably already realizing the initial pun: this tool for reflection is literally reflective. 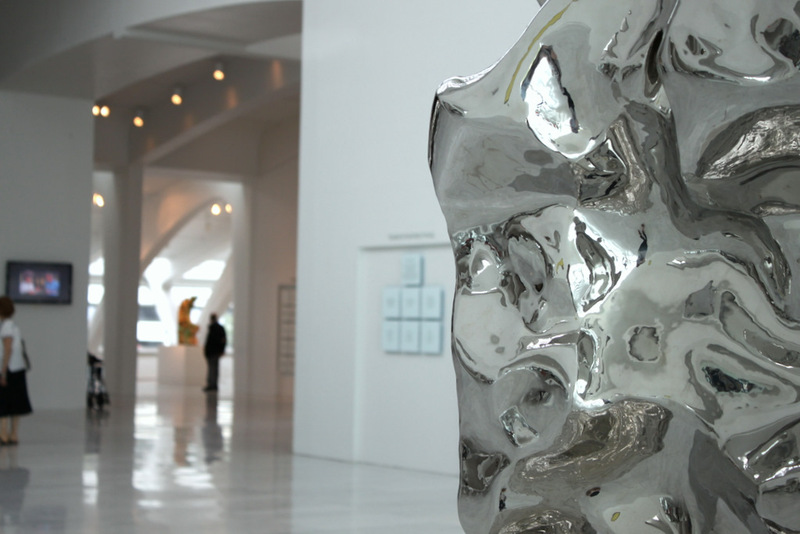 But Wang’s use of shiny stainless steel, that favorite of sculptors such as Anish Kapoor (artist of Chicago’s Cloud Gate, affectionately known as “The Bean”), forces us to reconsider a primarily introspective object when suddenly taken out of context and shared publicly. The shiny material communicates with the visual language of our developed world; stainless steel is an industrial material essential to our global economy. When we ponder a century’s old “scholar’s rock” made of modern material, upon what do we reflect? New, or old? Do we reflect together, or in solitude? Can introspective objects, like this artwork, be made public for more than just emperors or intellectuals to consider? You can find all of these objects (and more!) on view this summer at the Museum. Obviously, they beg multiple visits and opportunities for reflection–so make like an emperor and spend some leisure time with them, then come back and share your soul-searching thoughts with us. Berliner, Nancy. The Emperor’s Private Paradise: Treasures from the Forbidden City. New Haven: Yale University Press, 2010. Asian Art Museum, “Zhan Wang” website. Roberts, Brady. Docent Lecture at the Milwaukee Art Museum, June 2, 2011. 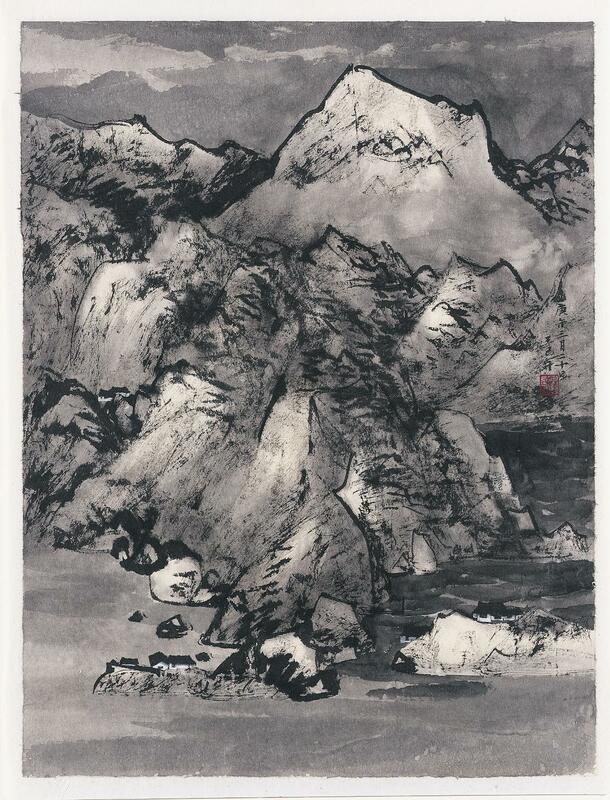 This entry was posted in Art, Exhibitions and tagged Chinese Art, Emerald Mountains: Modern Chinese Ink Painting from the Chu-tsing Li Collection, Exhibitions, Scholar's Rocks, Summer of CHINA, The Emperor’s Private Paradise: Treasures from the Forbidden City, Zhan Wang. Bookmark the permalink. Thank you for the thorough explanation of this sculpture. China has been the talk of our family since the amazing exhibitions have reached Milwaukee. My daughter shared with me just the other day, my grand daughter woke up one morning and stated she has been dreaming about China. Thank you for the dreams Milwaukee Art Museum. What a sweet response, Lynn! Everyone on staff and in the Museum community is learning so much about China through these great exhibitions. Another great group of art objects that it will be sad to see move along! Thank you for reading our blog and taking the time to comment. If you ever have any suggestions for the type of content you’d like to see on here, let us know! How wonderful stunning stone in china. I dream to go to China someday. That’s is very exploring country and have many accessible place. keep up the goodwork.